Originally known as the ‘Ladies’ Aid’ at the beginning of the 20th Century, the organization now called the Ladies’ Auxiliary has been an integral energy of the B’nai Jacob congregation in all aspects of religious and social functions and providing facilities and services for families and for communal celebrations. Through innovative fund raising and by establishing specific long-term Funds, the Auxiliary provides for the continuation of educational, charitable, and religious needs of the Synagogue and the greater community. The history of the Ladies’ Auxiliary is underwritten in every line of the history of B’nai Jacob, which unofficially began in the 1880s as a small community of Jewish immigrants. The first established Synagogue began in 1908 and, in the late 1940s, when plans were made to build a second and new Synagogue on Virginia Street, the Auxiliary helped fund substantial amounts toward the construction of the new building, completed in 1949. The funding also supplied most of the furnishings and equipment, including the impressive Oron Kodesh, still in use at the present time. Through the years, funding to provide education and events, especially for children, is a major goal for the Ladies’ Auxiliary. As stated in the history of B’nai Jacob, “Through the Kalman Shore Fund they under gird the activities of the Synagogue’s Young Peoples League; their annual dinners, under the chairmanship of the Rebetzin, Lillian Cooper, have been the main source for the budget of the Sunday School and holiday celebration for the children. 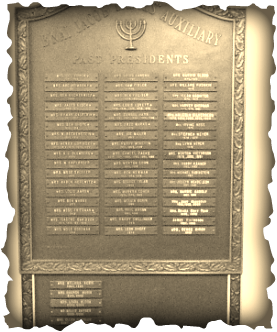 Located in the lobby of B’nai Jacob is a plaque engraved with the names and dates of all past Auxiliary Presidents, including that of Mrs. Cooper. These devoted women, guided by the By-Laws of the Auxiliary, worked diligently to meet and go beyond the needs of B’nai Jacob. Along with these serving Presidents is a Board and membership comprised of a Vice-President, Recording Secretary, Financial Secretary, Corresponding Secretary, Treasurer, the Ex-officio members, and a Nominating Committee. The duties of the Governing Board are to receive and discuss motions for the welfare of the Auxiliary and the advisability of recommending them to the body at its regular meeting. The history of the Ladies’ Auxiliary is a repetition of the history of the B’nai Jacob Synagogue due to the devotion and tireless energy of its members. Individually and collectively the Auxiliary is comprised of generations of women of valor. Moving further into this 21st Century, the evolution of the Auxiliary is inevitable, as it continues to meet the needs of B’nai Jacob in this new day. Through the years, the devotion of the Presidents, members of the Board, and general membership have never faltered nor ‘slumbered,’ providing a wonderful place to worship, to educate, to learn, to celebrate, to entertain, to play, and to be charitable in the truest tradition of Judaism. May it continue to be, L’Dor V’Dor – From Generation to Generation.